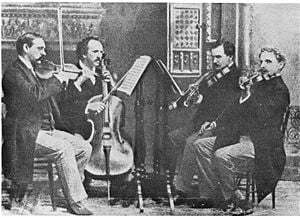 The Kneisel Quartet, led by violinist Franz Kneisel, early twentieth century. A string quartet is a musical ensemble of four string instruments—consisting of two violins, a viola, and a cello—or a music piece written to be performed by such a group. The string quartet is one of the most prominent chamber ensembles in Western classical music. 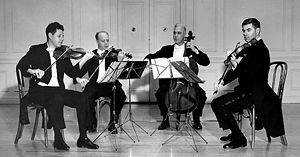 The quartet became popular in the beginning of the Classical period and was used by composers to exploit the varied tonal colors of the string instruments. Joseph Haydn pioneered the development of the form in the eighteenth century, and since then the string quartet has been considered a true test of the composer's art. Using four equal instruments demonstrated the importance of operating as a team with each member having an equal part in developing the thematic material. The quartet is a musical example of how the partnership of four distinct elements can co-exist in a mutually fulfilling way. Walter Willson Cobbett playing a concerto for violin, piano, and string quartet. Although any combination of four string instruments can literally be termed a "string quartet," in practice the term normally refers to a group consisting of two violins, one viola, and one cello. The "first" violin usually plays the melody line in the higher register of notes, and the "second" violin plays lower notes in harmony. The four instruments in the string quartet correspond to the four ranges found in vocal choirs—soprano, alto, tenor and bass. The standard string quartet is widely seen as one of the most important forms in chamber music, and most major composers from the late eighteenth century onwards wrote string quartets. "String quartet" refers not only to an ensemble of four instruments, but also to a type of music composition. A composition for four players of stringed instruments may be written in any musical form, but if the piece is a "string quartet" it is usually in four movements, with a large-scale structure similar to that of a symphony. In the classical string quartet form, the outer (first and last) movements are typically fast, and the inner movements consist of a slow movement and a dance movement of some sort (e.g., minuet, scherzo, etc.). Many other chamber groups can be seen as modifications of the string quartet, such as the piano quintet, which is a string quartet with an added piano; the string quintet, which is a string quartet with an extra viola, cello or double bass; the string trio, which contains one violin, a viola, and a cello; and the piano quartet, a string quartet with one of the violins replaced by a piano. Should a composer create music for four other string instruments—for instance, three violins and a bass; or violin, viola, cello, and guitar—the instrumentation is indicated specifically. The string quartet form first came to be used after the middle of the eighteenth century. 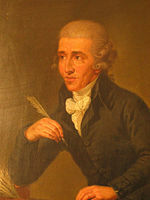 Joseph Haydn's first works for string quartet have five movements and resemble the divertimento or serenade, but the Opus 9 quartets of 1769–70 are in the form which was to become standard both for Haydn and other composers. They consisted of four movements: a fast movement, a slow movement, a minuet and trio, and a fast finale. Because his example helped codify a form that originated in the Baroque suite, Haydn is often referred to as "the father of the string quartet." Haydn occasionally performed his quartets on social occasions in an impromptu ensemble of which Mozart was also a member. Quartet composition flourished in the Classical era, with both Mozart and Beethoven writing famous series of quartets to set alongside Haydn's. A slight slackening in the pace of quartet composition occurred in the nineteenth century. Several composers wrote only one quartet, perhaps to show that they could fully command this hallowed genre. 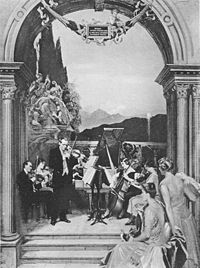 With the onset of the modern era of classical music, the quartet returned to full popularity among composers. The 16 string quartets of Ludwig van Beethoven (1770-1827) are considered to be among the most important works in the genre. They are generally categorized as being the early, middle, and late quartets. The final six quartets (Nos. 1-6, Opus 18) are considered to demonstrate Beethoven's total mastery of the form as it evolved from those of Franz Joseph Haydn (1732-1809) and Wolfgang Amadeus Mozart (1756-1791). The Razumovsky Quartets, composed in 1805-1806 as result of a commission by Count Andreas Razumovsky, remain extremely popular as they demonstrate the composer's greater expression of emotional sensitivity and drama. The late Beethoven quartets, which include his final five quartets and the Große Fuge, are the composer's last compositions. These works eschew the Romantic ethos of the middle quartets and tend to be highly complex in their harmonic and structural invention. The complex harmonic and melodic nature of these works puzzled many who were familiar with Beethoven's early and middle quartets and some extrapolated that Beethoven's increased deafness late in his life caused the great composer to lose his musical bearings. Other nineteenth-century composers who wrote important works in the string Quartet genre include Franz Schubert, Johannes Brahms and Antonin Dvorak. The string quartet remained a viable form in the early part of the twentieth century. Dmitri Shostakovich composed 15 string quartets and Bela Bartok wrote six. Bartok's quartets are considered among his most important works. Important twentieth-century works in the genre include those composed by Leos Janacek, Maurice Ravel, Claude Debussy, Samuel Barber, Elliot Carter, Arnold Schoenberg, and Sergei Prokofiev. Barber's String Quartet, Opus 11, yielded his popular Adagio for Strings, which was performed on a national radio broadcast after the passing of President Franklin D. Roosevelt. Ever since Joseph Haydn's day, the string quartet has been prestigious, considered a true test of the classical composer's art. This may be partly due to the fact that the palette of sound is more restricted than with orchestral music, forcing the music to stand more on its own rather than relying on tonal color, or from the inherently contrapuntal tendency in music written for four equal instruments. These four equal instruments demonstrated the importance of operating as a team with each member having an equal part in developing the thematic material. The string quartet became a fashionable aspect of eighteenth-century European society as wealthy patrons used the quartet as fashionable entertainment in their homes. For the purposes of performance, string players sometimes group together temporarily to make ad hoc string quartets. Other groups continue playing together for many years, sometimes changing their members but retaining their name as a group. 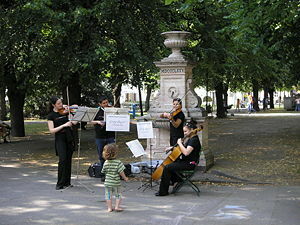 The most prominent ensembles of the genre include the Juilliard String Quartet, the Emerson String Quartet, the Guarneri String Quartet, The Melos String Quartet (Stuttgart), the Fine Arts String Quartet, the Budapest String Quartet, the Talich String Quartet, the Tackacs String Quartet, the Tokyo String Quartet, the Cleveland String Quartet, and the Vienna String Quartet. These ensembles are among the most recorded ensembles of the genre, further evidence of their highly developed artistry. 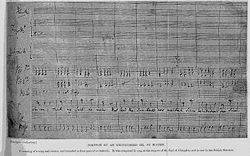 Portion of an original manuscript by Haydn, in the British Museum. 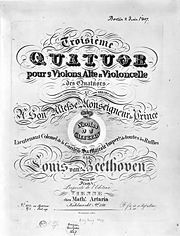 Cover sheet of Beethoven's thirteenth string quartet as published in Berlin on June 2, 1827. Joseph Haydn's 68 string quartets, especially the inventive Op. 33 set of six and the six late Erdody Quartets, Op. 76. Wolfgang Amadeus Mozart's 23 string quartets: the six he dedicated to Haydn in particular (K. 387, 421, 428, 458, 464, 465, Opus 10) are generally considered to be the pinnacle of the classical quartet form. String Quartet No. 19 in C major ("Dissonance"), K. 465 is still surprising for its dissonant opening. The 16 quartets of Ludwig van Beethoven are highly acclaimed. The String Quartets Nos. 1-6, Opus 18 are thought to demonstrate his total mastery of the classical string quartet as developed by Haydn and Mozart. The next three, or the Razumovsky Quartets are extremely popular even today, as they greatly expanded the form and incorporated a new degree of emotional sensitivity and drama. These were followed by String Quartets Nos. 10 - 11, Opus 74 "Harp" and 95 "Serioso" (Beethoven). Finally, the Late Beethoven String Quartets, which group includes his last five quartets and the Große Fuge, are the composer's last completed works. These works are widely considered to be among the greatest musical compositions ever written. Franz Schubert's String Quartet No. 14 in D Minor "Death and the Maiden". Also his String Quartet No. 13 in A Minor "Rosamunde" and his final String Quartet No. 15 in G Major. Peter Tchaikovsky's String Quartet No. 1 in D Major, Op. 11, especially the second movement "Andante cantabile." Alexander Borodin's String Quartet No. 2 in D Major, especially the third movement "Notturno." Leoš Janáček's String Quartet No. 1 "Kreutzer", inspired by Tolstoy's The Kreutzer Sonata, which in turn was inspired by Beethoven's Violin Sonata No. 9, the "Kreutzer Sonata." This page was last modified on 23 October 2015, at 15:28.